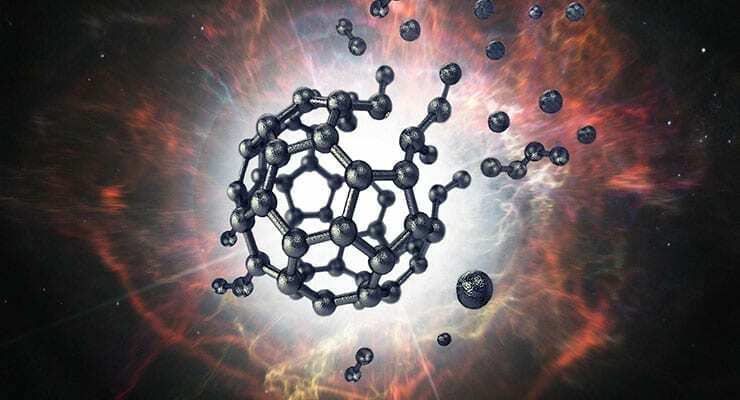 In 1996, a trio of scientists won the Nobel Prize for Chemistry for their discovery of Buckminsterfullerene – soccer-ball-shaped spheres of 60 joined carbon atoms that exhibit special physical properties. Now, 20 years later, scientists have figured out how to turn them into Buckybombs. These nanoscale explosives show potential for use in targeting specific cells, triggering tiny explosions that kill specific cells without affecting surrounding tissue. “Future applications would probably use other types of carbon structures – such as carbon nanotubes, but we started with Bucky-balls because they’re very stable, and a lot is known about them,” said Oleg V. Prezhdo, professor of chemistry at the USC Dornsife College of Letters, Arts and Sciences and corresponding author of a paper on the new explosives that was published in the Journal of Physical Chemistry on February 24. Carbon nanotubes, close relatives of bucky-balls, are used already to treat cancer. They can be accumulated in cancer cells and heated up by a laser, which penetrates through surrounding tissues without affecting them, and targets carbon nanotubes directly. Modifying carbon nanotubes the same way as the buckybombs will make the cancer treatment more efficient – reducing the amount of treatment needed, Prezhdo said. To build the miniature explosives, Prezhdo and his colleagues attached 12 nitrous oxide molecules to a single Bucky-Ball and then heated it. Within picoseconds, the Bucky-Ball disintegrated — increasing temperature by thousands of degrees in a controlled explosion. The source of the explosion’s power is the breaking of powerful carbon bonds, which snap apart to bond with oxygen from the nitrous oxide, resulting in the creation of carbon dioxide, Prezhdo said. Read the study at the Journal of Physical Chemistry: Buckybomb: Reactive Molecular Dynamics Simulation. Want more from Global Biodefense?